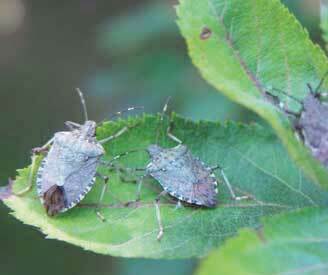 Typical of other stink bugs, has a shieldshaped body and emits a pungent odor when disturbed. With a mottled brown, 1/2 in. body, it has characteristic alternating dark and light bands across the last two antennal segments that appear as a single white band in both nymphs and adults (the most distinguishing characteristic). Learn more here. 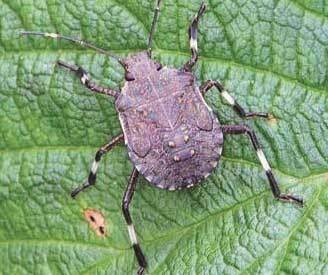 Pests of various crops, but in the U.S. it has been primarily reported as a household nuisance and ornamental pest. Has been found feeding in apple orchards, and in Asia, feeds on ornamental plants, weeds, soybeans, apples, peaches, figs, mulberries, citrus fruits, and persimmons. Introduced from Asia, has been expanding its range since its U.S. discovery in Allentown, Pennsylvania, in 2001. Spreads by hitchhiking or through commercial sale of infested host plants. Small necrotic spots on fruit and leaf surfaces often result from feeding damage. First detected in Nebraska in 2010. Is now becoming more widespread.